how many tendons are involved? How far has the torn edge pulled from the bone? Does it have enough healing potential? 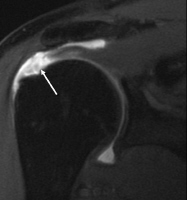 has the tear caused irreversible joint or muscle damage? How healthy is the patient overall? Is the patient ready, able, and willing to follow instructions during the recovery phase? The rotator cuff is a group of four tendons, and tears can be as little as a partial tear of one tendon, or can involve all four. The torn edge of the torn tendon can be still in place waiting to be reattached in place, or it could have pulled as far as 2 inches away making attempts at repair much more difficult. The tendon substance may be intact and healthy, or it could be degenerated and weak in such a way that it may not be able to hold a stitch. The muscle working the tendon may be perfectly healthy but has no tendon to pull on, or it may have become degenerated, and replaced with fat tissue so much so that even if the tendon heals, the muscle may be too weak to pull on it. When the tendon and the muscle are degenerated, the joint may lose balance and the ball may gradually slip out of the pocket and cause irreversible damage (cuff tear arthritis), making any attempt at tendon repair futile. So all the above mentioned factors need to be carefully weighed when considering surgery. Discomfort after surgery is expected and may decrease with taking pain medicines as prescribed. The arm will be placed in an immobilizer for a defined period of time, and is not to be removed except upon instruction of the therapist and upon direction from the surgeon. During the first period, the shoulder is rested. Exercises of the elbow, wrist, and hand are encouraged. After a short period of time, passive exercises that move your arm may be done about 3 times a day (a machine or physical therapist may help the joint through its range of motion).are started under supervision. Active exercises may start 6 to 8 weeks after surgery. Strengthening exercises, beginning with light weights and progressing to heavier weights, can start at around 3 months after surgery. During this whole process, the most valuable player is the patient. It is the patient who determines that surgery is warranted; it is the patient that has full control of the recovery period; and it is the patient’s body that determines healing (assuming a successful and strong repair was achieved); and it is the patient who sets his/her goals and expectations.